I really didn't know what to expect, as this is my first drum software purchase (EZ Drummer, Made of Metal EZX, Metal Machine EZX) . After weighing the pros and cons of all the software available to me, I felt this fit my needs. It would allow me to upgrade to Superior Drummer. 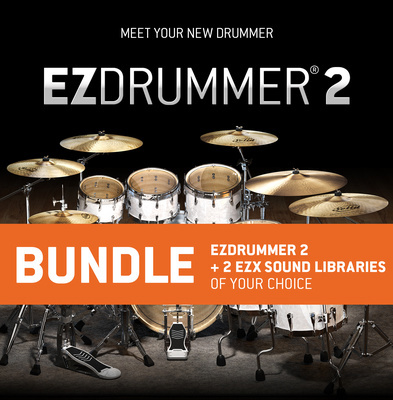 I have been very impressed with how, through combining grooves, fills, and other pieces of drum music available, EZ Drummer allows me to put together drum lines that not only fit, but enhance and accentuate the other musical elements present. As a bass player I am very familiar with how drums, and the rhythm section, fit within a composition, and EZ drummer made applying what I know, with its user-friendly interface and many available options, much easier than I had anticipated. Given that I am playing guitars, bass, most of the vocals, and the occasional synth for atmosphere, I now feel confident that I can provide the drums and percussion for all of my compositions. However, the quality of the sound, and ability to modify the sounds to fit what I am writing, has been the most pleasant and rewarding aspect of exploring and applying EZ Drummer 2. The drums sound great and i like the possibilitie of buying a bundle. ID: 399412 © 1996–2019 Thomann GmbH Thomann loves you, because you rock!